CRU, 125 Main St., lower-level entrance off Parker Harding Plaza. 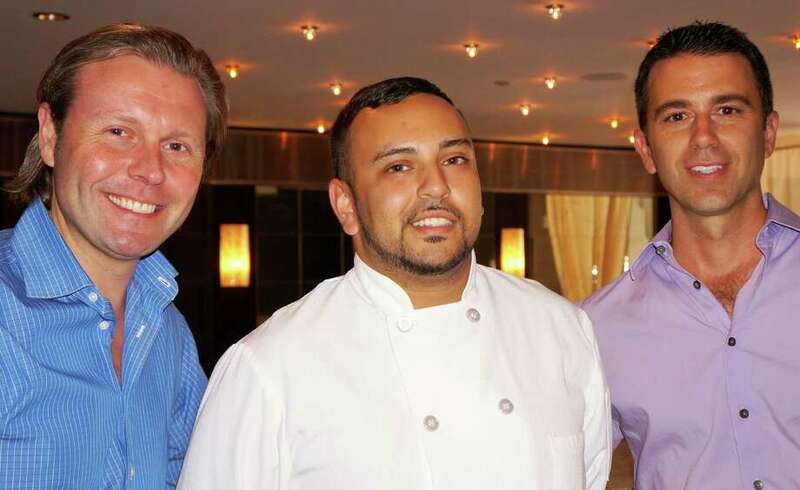 Pictured are, from left, owner Todd Rose, executive chef Sergio Reyes and owner Steve Prokop. CRU, the stylish restaurant that opened in June in the lower level at 125 Main St. is now serving lunch. "The menu is a very focused multinational menu," said Sergio Reyes, the executive chef. "It splits into three regions -- American, Pacific and Mediterranean. It is focused on wine pairing and small plates. Our menu has specific wine pairings listed under each dish. So obviously we have an extensive wine and cocktail list, and the food goes along with it." American: "We have a play on grilled cheese and tomato soup. It's a brioche midnight moon grilled cheese with green tomato gazpacho, paired with Lucien Albrecht sparkling rose." Pacific: "Braised pork belly with dumplings and a corn puree, paired with a Cline Viognier." Mediterranean: :For a small plate, we have hummus fries ... fritters made from chic pea flour served with piquillo pepper ketchup. Suggested pairing is a Chat St. Michelle merlot." CRU is owned by Todd Rose and Steve Prokop, and Rose points out that the restaurant also has full entrees for lunch and dinner. For more information about CRU, check www.cruwestport.com or call 203-222-0924.